I haven't found time to blog about individual things, so here is one post that summarizes various Emscripten-related things that happened over the last few months. 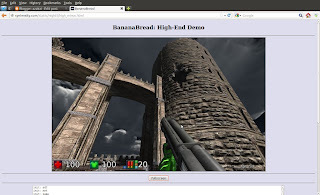 BananaBread, a port of the Cube 2 game engine to the web, was launched and then received a few minor updates with bugfixes and some additional experimental levels. 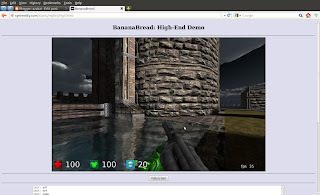 Feedback was good, and it was linked to by a Firefox release announcement and later a Chromium release announcement, in both cases to show that each browser is now capable of running first person shooter games. I gave a talk together with Kevin Gadd at GDC Online, here are my slides. We talked about compiling games to HTML5, I focused on C++ and Kevin on C#, so overall we covered a lot of potential codebases that could be automatically ported to the web. Support for worker threads is in the incoming branch, look in emscripten.h and for tests with "worker_api" in them in tests/runner.py. This API basically lets you compile code into "worker libraries" that the main thread can then call and get responses from, giving you an easy way to do message-passing style concurrency. The API is in initial stages, feedback is welcome. Initial support for networking using websockets has also been implemented, see tests with "websockets" in their name. Basic sockets usage works, however we have had troubles with setting up a testing websocket server with binary support, see the issue for details. Because of that this won't work on arbitrary binary data yet. If you know websockets and websocket servers and are interested in helping with this, that would be great. Another approach we intend to work on, and where help would be welcome, is WebRTC. WebRTC could actually be easier to work with since it supports p2p connections, so it's easy to test a connection from one page to itself. It also supports UDP-style unreliable data, so we should be able to get multiplayer working in BananaBread when that is complete. We currently have the "bindings generator" which is used to make ammo.js and box2d.js. It works for them, but needs manual hacking and has various limitations. A more proper approach is being worked on, contributed by Chad Austin, which he called "embind". This is a more explicit, controllable approach to bindings generation, and in time it should give us big improvements in projects like ammo.js and box2d. If you use those projects and want them to improve, the best way is to help with the new embind bindings approach. We have some initial test infrastructure set up, and there are various bugs filed with the tag "embind" if you are interested. I did some experiments with an LLVM backend for Emscripten when I had free time over the last few months. The results were interesting, and I got some "hello world" stuff working, during which I learned a lot about how LLVM backends are built. On the one hand, this doesn't matter that much - it's done offline by the compiler. People running the generated code don't notice it. But of course, making developer's lives easier is important too. In Emscripten the goal has always been to focus more on performance of the generated code rather than performance of the compiler itself, so we have added new optimization passes even when they were expensive in compilation time, as long as they made the generated code faster. 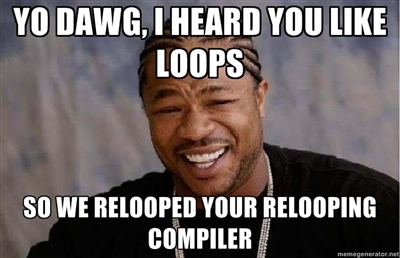 And we rely on tools like Closure Compiler that take a long time to run but are worth it. But compiler perf vs code perf isn't an all of nothing decision. Right now on the incoming branch there are some (not fully finished and slightly buggy, but almost ready) optimizations that improve compilation time quite a bit. And with those in place we can move towards parallel compilation in almost all of the optimization passes, so with 8 cores you might get close to 8x speedups in compilation, etc. So the current goal is to focus on the existing compiler. It will get much faster than it is now, but it will probably never get close to the speed an LLVM backend could get, that's the tradeoff we are making in order to focus on generating faster code. An additional reason this tradeoff makes sense is that we currently have plans for several new types of optimizations to make the generated code yet faster, and it is far easier for us to work on them in the current compiler than an LLVM backend. Finally, we added a system for recording and replaying of Emscripten-compiled projects (see reproduceriter.py). With it you basically compile your project in a special mode, run it in record mode and do stuff, then you can run the project in replay mode and it will replay the exact same output you saw before. The main use case for this is benchmarks: If you have a program that depends on user input and random things like timing or Math.random(), then it is very hard to generate a good benchmark from it because you get different code being run each time. With the record/replay facility you can basically make a reproducible execution trace. 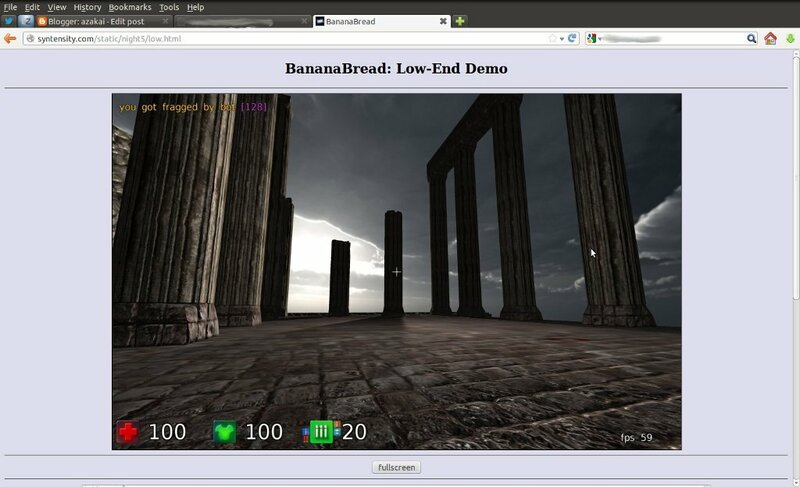 This has been tested on BananaBread so far, and used to create BananaBench, a benchmark based on BananaBread. You can either run it in the browser or in the shell, and hopefully a real-world benchmark like this will make it easier to optimize browsers for this kind of content. Starting up as quickly as possible is always best on every platform. This is a general issue so I won't focus on it, because on the web, there is also another important criterion, which is to start up in as asynchronous a way as possible. By asynchronous I mean to not run in a single large event on the main thread: Instead it is better for as much as possible to be done on background threads (web workers) and for what does run on the main thread to at least be broken up into small pieces. Why is being asynchronous important? A single long-running event makes the page unresponsive - no input events are being handled and no output is being shown. This might seem not that important for startup, when there is little interaction anyhow. But even during startup you want to at least show a progress bar to give the user an indication that things are moving along, and also most browsers will eventually warn the user about nonresponsive web pages, showing a scary "slow script" dialog with an option to cancel the script or close the page. If you're writing a new codebase, you would indeed make everything asynchronous. All pure startup calculations would be done in background threads, and main thread events would be very short. Here is an example of such a recently-launched product: The worst main thread stall during startup seems to be about half a second, not bad at all, and a friendly progress bar updates you on the current status. When you are writing a new codebase it is straightforward to design in a way that makes nice startup like that achievable. But you can still asynchronize even such a codebase: Here is what startup was like until recently: BananaBread r13, and and here is what it looks like now: BananaBread r15. The worst main thread stall is 1.4 seconds on my laptop, which is not great but definitely enough to prevent "slow script" warnings on most machines, and there is now a progress bar. Cube 2 levels (or maps as they are called) are gzip compressed, and the engine decompresses them during startup. I refactored that and BananaBread now decompresses them using zee.js during preloading, also in a worker. 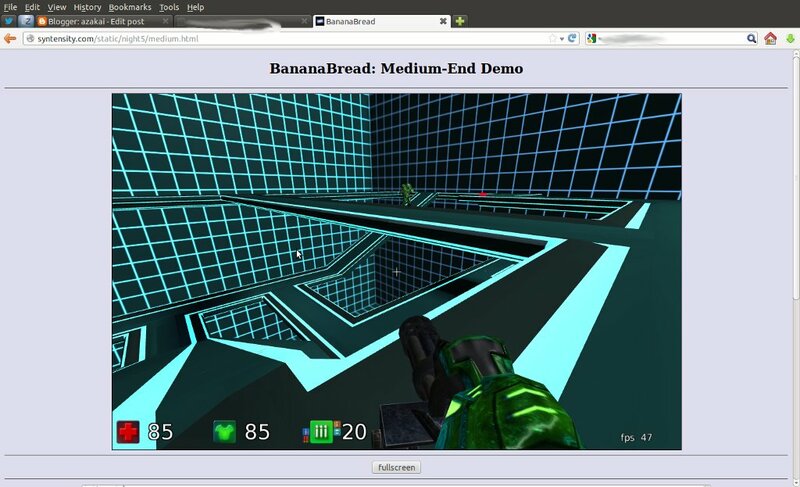 Taking these three points together, BananaBread can use three cores during the preloading phase. This is actually an improvement on the original game engine which is single-threaded! After preloading, the compiled engine starts to run and we are necessarily single-threaded. The important thing to do at this stage is to at least break up the startup code into small-enough pieces to avoid freezing the main thread. This requires refactoring the original source code, and is not the most fun thing in the world, but definitely possible. Emscripten provides an API to help with this (emscripten_push_main_loop_blocker etc. ), you can define a queue of functions to be called in sequence, each in a separate invocation. So the tricky part is just to deal with the codebase you are porting. Over a few days I broke up the biggest functions called during startup, getting from a maximum of 6 seconds to 1.4 seconds. Browsers seem to complain after around 10 seconds, so 1.4 isn't perfect, but on machines 7x slower than my laptop things should still be ok. Further breaking up will be hard as it starts to get into intricate parts of the game engine - it's possible, but it would take serious time and effort. Download time: My personal server that hosts the BananaBread links above is not that fast, and doesn't even do gzip compression. We hope to get a more serious hosting solution before BananaBread hits 1.0. GPU factors: BananaBread compiles a lot of shaders and uploads a lot of textures during startup. On the plus side, the time these take is probably not much different than a native build of the engine, but it's noticeable there too. Data: Smaller levels lead to faster startup and vice versa. Our levels aren't done yet, we'll optimize them some more. In that demo two APIs are provided from the compiled game engine: camera control and particle effect creation. The scripting API used in them begins here, and an example use can be seen here. Make a C API if the code is in C++. You can use C++, but then you need to deal with name mangling and this pointers in a manual way - C is easier. Example. 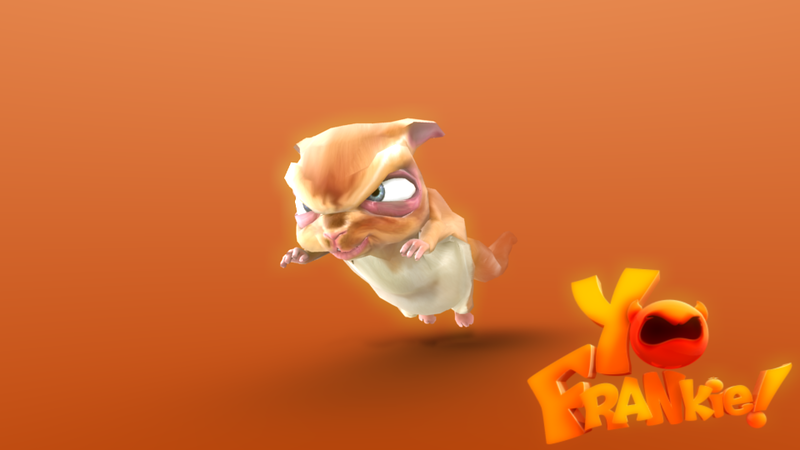 (the squirrel model is from the Yo Frankie game). Very misleading. I have no idea which of StatCounter and Net Applications is more accurate. But that argument is off. In statistics, sample size is basically irrelevant past a certain minimal size. That's how a survey of 300 people in the US can predict pretty well for 300 million. The number of people doesn't matter in two ways: First, it could be 1 million or 1 billion, the actual population size is irrelevant, and second, it could be 3,000 or 30,000 and it would not be much better than 300. The only exception to those two facts is if the population size is very small, say 100. Then a sample size of 100 is guaranteed to be representative, obviously. And for very small sample sizes like say 5, you have poor accuracy in most cases. But just 300 people is enough for any large population. The reason is the basic statistical law that the standard deviation of the sample is the same as of the population, divided by the square root of the sample size. If you are measuring something like % of people using a browser, the first factor doesn't matter much. That leaves the second. Happily for statistics, 1 over square root decreases very fast. You get to accuracy of a few percent with just a few hundred people, no matter what the population size. So that StatCounter has 3,000,000 websites and Net Applications has 40,000 means practically nothing (note that 40,000 even understates it, since those are websites. The number of people visiting those sites is likely much larger). 40,000 is definitely large enough: In fact, just a few hundred datapoints would be enough! Of course, that is only if the sample is unbiased. That's the crucial factor, not sample size. We don't really know which of StatCounter and Net Applications is less biased. But the difference in sample size between them is basically irrelevant. Past a minimal sample size, more doesn't matter, even if it seems intuitively like it must make you more representative. 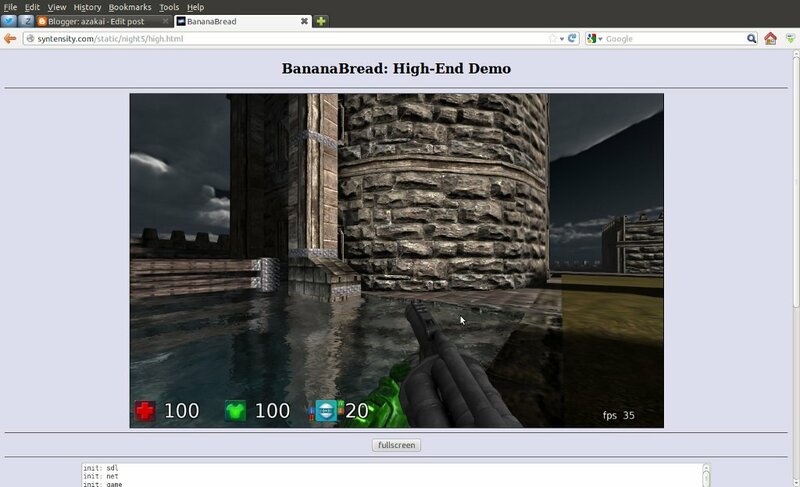 On the current Firefox GA Release (13) the frame rate with 80 blocks often drops briefly to 20fps, which is not great. But on Firefox Nightly (16), I get very smooth frame rates, very close to 60fps! I see similar results in Chrome Dev (21) as well . 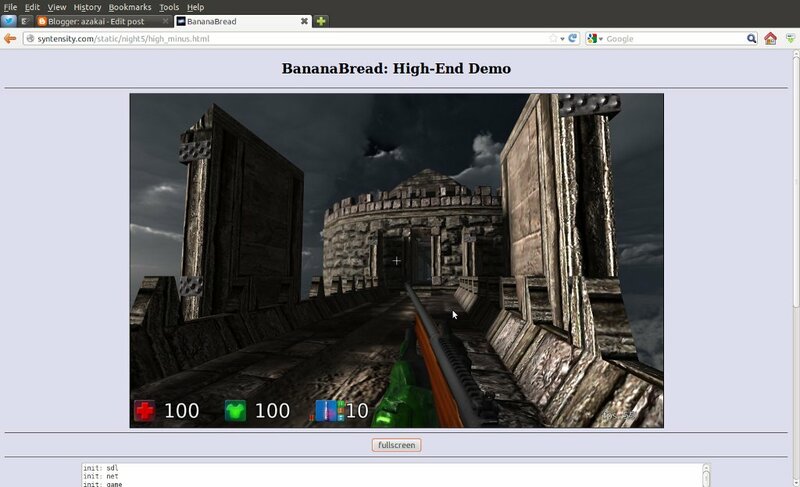 So it looks like it is now possible to run games on the web with lots of 2D physics in them. On Opera 12 I manually enabled WebGL, but sadly the page doesn't render properly. And of course there are other nice things like being able to print out new Error().stack to get a stack trace at any point in time, JSON.stringify(x, null, 2) to get nice pretty-printed output of any object, etc. There is also a debugging mode, in which a lot of debug info will be printed out, including (from the C API) a C program using the C API, which is useful for generating testcases. LLVM 3.1 support for Emscripten just landed in master, all tests pass and all benchmarks either remain the same, or improve from 3.0. LLVM 3.1 is now the officially supported version, all testing from now on will be on 3.1. The Emscripten tutorial has been updated to reflect that. 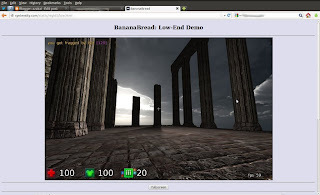 So this is a very very early demo - ignore performance and content quality. Also, it might not work in all browsers yet, sorry about that: Seems fine in Firefox 15, including pointer lock and fullscreen mode, but for some reason in Chrome 20 pointer lock isn't working. I do get 60fps in both of them though on my 2 year old MacBook (note that the frame rate is capped at 60 using requestAnimationFrame, so that it does not go higher is not an indication of anything). After the disclaimers, I did want to blog about this because despite being very early, I think it does show the potential of this approach. 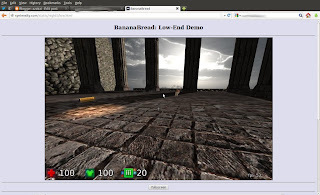 We are taking a C++ game engine using an oldish version of OpenGL, and with almost no changes to the source code we can compile it using open source tools to something that runs on the web thanks to modern JS engines, the fullscreen and pointer lock APIs and WebGL, at a reasonable frame rate, even before optimizing it. Emscripten supports the WebGL-friendly subset of OpenGL and OpenGL ES quite well. That subset is basically OpenGL ES 2.0 minus clientside arrays. If you are writing C++ code with the goal of compiling it to WebGL, using that subset is the best thing to do, it can be compiled into something very efficient. We should currently support all of that subset, but most of it is untested - please submit testcases if you can. Emscripten now also supports some amount of non-WebGL-friendly OpenGL stuff. We will never support all of desktop OpenGL I don't think - that would amount to writing an OpenGL driver - but we can add parts that are important. Note that we are doing this carefully, so that it does not affect performance of code that uses just the WebGL-friendly subset, the additional overhead for supporting the nonfriendly features is only suffered if you deviate from the friendly subset. Specifically, the non-friendly features we partially support include pieces of immediate mode, clientside state and arrays, and shader conversion to WebGL's GLSL. Again, we have only partial support for those - it is best to not rely on them and to use the WebGL-friendly subset. The parts we support are motivated by what Sauerbraten's renderer requires (note that even to render the GUI, you need a immediate mode support, that's all done with OpenGL and not some 2D API). The demo is the result of about a month of work. Almost all of that time was spent in learning OpenGL (which I had never used before) and writing the emulation layer for OpenGL features not present in WebGL, basically proceeding testcase by testcase after generating testcases from Sauerbraten. Aside from that, everything else pretty much just worked when compiled to JS. The plan is to continue this port, and help is welcome. Basically we want to get the entire game working, including model rendering (the main part of the Sauerbraten renderer I haven't looked at yet), AI bots and so forth, and to use professionally designed levels and models. At some point we will probably want to optimize the code as well. 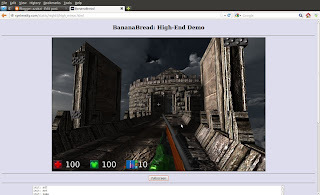 The goal is to end up with a playable, good looking 3D FPS game that runs on the web, that is open source and is built using open source tools, so other people can learn from the project or even use the code directly. The gane will initially be single player versus some bots, but eventually using WebRTC we should be able to get multiplayer mode working as well (WebRTC should land in most browsers later this year). Aside from this specific game port, Emscripten's OpenGL support has greatly improved, and there are other projects using it already. If you use the WebGL-friendly subset of OpenGL, it is ready for use now, with the disclaimer that while everything should work we have not rigorously tested it yet, help with testing and testcases would be welcome. In particular if you have some application you want to port, if you find problems in our OpenGL support please file a bug with a testcase, for the WebGL-friendly subset those should be easy to fix and we can add the testcase to our test suite so we don't regress on the features your project needs. For that reason, it didn't seem like a good idea to build C and C++ standard libraries, ship them with your code, and link them at runtime: The standard libraries are quite large. Furthermore, Emscripten doesn't have a single ABI, it has several code generation modes, as one example there are two typed array modes and one mode without typed arrays, and code compiled with one is not interface-compatible with another. Not having a stable ABI lets us generate more specialized and efficient code, but it is another reason for not shipping separate linkable standard libraries. Instead, when compiling code with Emscripten we build the standard library along with your project's code. Everything is then shipped as a single file. This gives the advantages mentioned before: Smaller code size since we know which parts of the standard library you actually need, and faster code since we can specialize both the standard library and your own code, not just your own. However, there are two disadvantages of this approach. The first is that combining the standard libraries with your own code means they form a single "unit". When normally you build your code and then link to the LGPL-licensed GNU standard libraries, it's clear that your code does not need to comply with the LGPL (you just need to comply with the LGPL regarding the LGPL'd library itself). But if you build your project together with the standard library, intertwining them in an optimized way, it is less clear how the LGPL applies here. I actually don't think there is a problem - it seems equivalent to the former "normal" case to me, despite the differences between them - however, I am not a lawyer, and also it is better to avoid any possible confusion and concern. In addition, even if the LGPL still applies just to the library, you would be shipping the library yourself, meaning you need to comply with the LGPL for it (which I don't think is a problem myself, but it is a concern for other people). For those reasons, Emscripten doesn't include any LGPL code. That ruled out using the GNU standard C and C++ libraries, which would otherwise be the first choice because of their familiarity and compatibility with existing code.